73-80 CHEVY SMALL BLOCK BEL AIR/IMPALA 3ROW ALUMINUM RACING RADIATOR+X2 BLUE FAN. Racing Radiators were designed to provide maximum cooling efficiency to prevent premature engine failure. DNA Radiators are full light-weight, high-heat transferring aluminum featuring a tube and fin design that dramatically increases surface area that enables the heat to dissipate more efficiently. DNA Radiators are at least 40% more efficient than stock. Most importantly, aluminum radiators have a much higher capacity for coolant than stock which means that your cooling system will be more efficient and will be more resistant to temperature surges in racing applications. Never been Used or Installed. Made of High Quality T-6061 Full Aluminum Construction. Direct Bolt-On OEM Fitment or Replacement. Stronger & Higher Capacity for Coolant than Stock Units. Improves Cooling by 35 45% Temp. Overall Size: 33.0" x 18.375" x 2.625. Core Size: 28.125" x 17.125" x 2.375. Inlet/ Outlet: 1.5"/ 1.625". Exactly the Same as the Picture Above (Hardware Included). Professional Installer is Highly Recommended. 12 Slim Radiator Fan has an ultra slim design so the fan can be installed flush against your radiator. Thanks to the Universal Fan Mounting Kit, the fan can be mounted to any radiator. It can also be mounted in the most convenient position to allow for more leniencies for other aftermarket parts. Can be used in a wide variety of other applications as well, including A/C condenser cooling, mounting on an intercooler to prevent heat soak during drag racing events, or cooling the radiator in a water-to-air intercooler setup. Unlike some of the universal fans out there, our fans include the mounting feet and ALSO come with through-radiator mounting kits Unlike some of the universal fans out there, our fans are only 2.5A deep at the deepest point, making them ideal for installations in cramped areas. High Quality Lightweight Plastic Durable Material. Slim Style, Bring More Space for Engine Modification. Direct Bolt-On Installation, Required No Modification. OE Fitment or Replacement, Push or Pull Type. Exactly Same As The Picture Below. Professional Installation is Highly Recommended (No Instruction Included). Direct Tie-On Installation, Slim Style. PLEASE CHECK COMPABILITIES DIRECT FITS FOR MANUAL 4.1L / 4.8L L6 or 5.0L 305Cu. WE HIGHLY RECOMMEND PROFESSIONAL INSTALLATION! DNA Motoring came about more than a decade ago with only one thing in mind and that was providing performance parts solutions to the car enthusiast. Being car guys ourselves, we understand first hand on what the community demands and what it thrives on. Throughout the years the automotive scene has been evolving and so have us. We have been swift in adapting to the industry changes and catering our new products to fit the current needs. DNA Motoring has been the umbrella corporation for other brands and web presences so that we can more specifically market to the proper customer demographics and hopefully reach out to as many individuals and groups as possible. We begin with our factories overseas, where we do heavy research and development in testing car applications and fitments for our products. In addition, we also do rigorous testing on the strength, durability, as well as longevity of the material in order to make sure when the product arrives at the consumers end that it's ready to go without worries. During stressful conditions such as climate and road conditions, there is a great strain that is put on the vehicle and we keep this in mind while we design and test our products to ensure maximum performance as well as safety. The last thing we want to hear is having our products fail at its most crucial needed moment so we strive to do all that we can to minimize such events from even occurring. Trust in our commitment in custom manufacturing each and every one of our parts as we continue in providing quality made products backed by top notch service. Where DNA Motoring shine is we operate and manage several factories in which we're able to govern and oversee ourselves in order to keep costs down and ultimately reducing end consumer prices dramatically. We like to stay competitive in our pricing and constantly adjust to the ever-shifting market values. Package will be held until a valid physical address is provided. Sign up to our Newsletter. Get all the latest News, Updates and Special Offers about our store. The item "73-80 CHEVY SMALL BLOCK BEL AIR/IMPALA 3ROW ALUMINUM RACING RADIATOR+X2 BLUE FAN" is in sale since Wednesday, January 30, 2013. 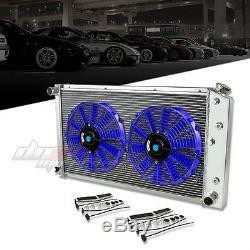 This item is in the category "eBay Motors\Parts & Accessories\Car & Truck Parts\Cooling System\Radiators & Parts". The seller is "dnamotoring" and is located in Rowland Heights, California. Overall Dimensions (IN): 33.00" x 18.50" x 2.75"
Core Dimensions: 28.25" x 17.25" x 2.50"